The southeast corner of Beneva Road and Webber Street doesn’t look like much as you zip by in your car, but if you take the time to prowl the parking lot, you’ll find a global dining scene that will have you hopping continents like you were eating at Epcot. There are multiple pizza places, a ceviche joint, a Colombian restaurant and market, an Argentinian pastry shop, two pubs and, as of late last year, an excellent Japanese restaurant: Bushido Izayaki. Owner and chef Jon Woo. 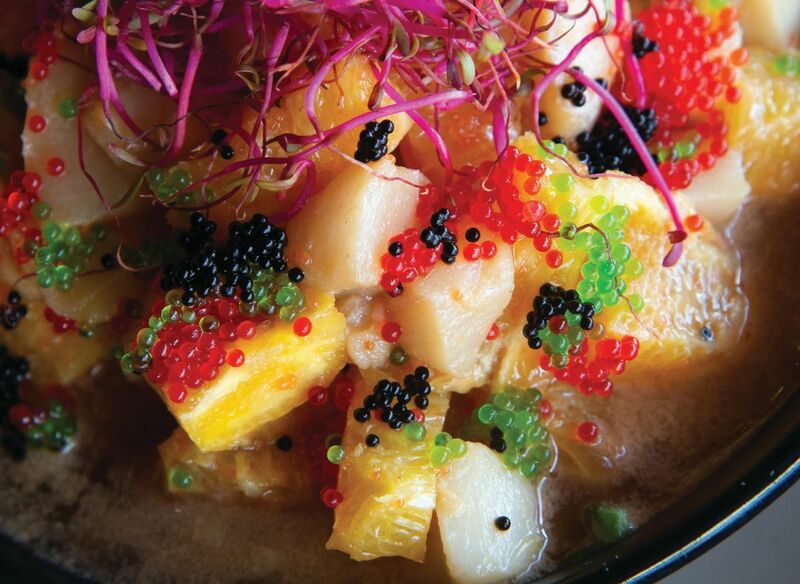 Jon Woo opened Bushido after running a sushi restaurant in New York City for 15 years. (Woo has no relation to the director of Face/Off, nor does Bushido have any relation to the Venice restaurant that goes by the same name.) “Bushido” is a reference to the samurai code of ethics, and you’ll find warrior-themed designs throughout the 4,000-square-foot space. According to a note on the menu, the bushido code emphasizes loyalty, self-sacrifice, justice, a sense of shame, purity, frugality, honor and affection. 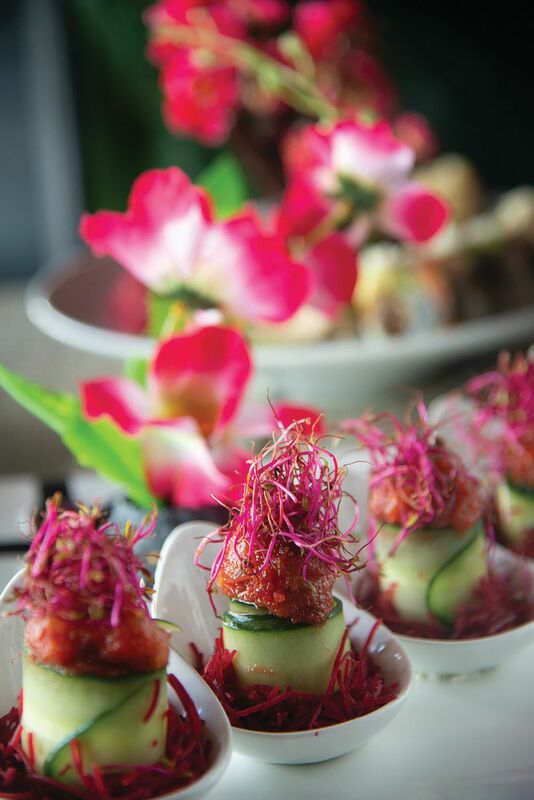 Of those, you’ll find purity at Bushido, with its emphasis on fresh, high-quality seafood. Frugality? Not so much, given that the menu overflows with wonderful, decadent options. 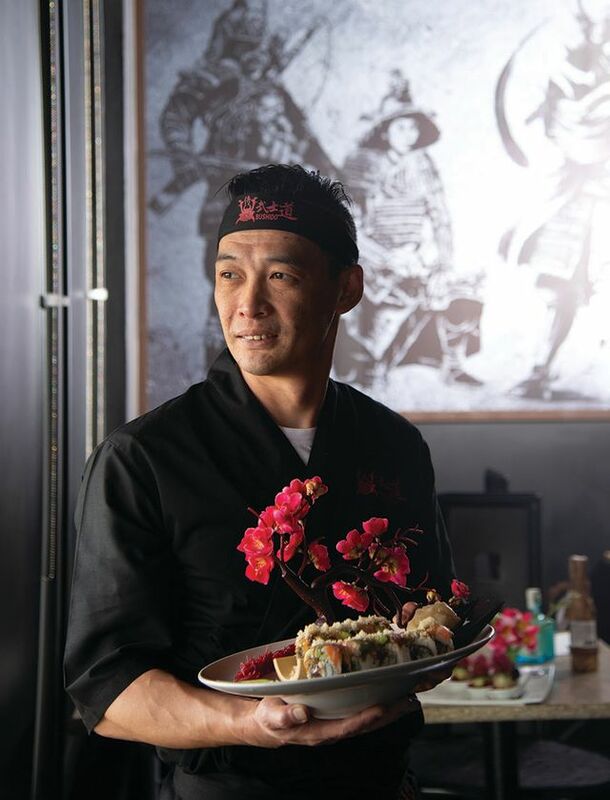 The food follows the general template of Sarasota Japanese restaurants, with a mix of maki rolls, sashimi, noodle dishes and tempura, but Woo’s attention to nuance distances it from most competitors. His “signature” rolls are particularly enticing. An eight-piece Gucci roll ($15) contains peppered tuna and tempura flakes on the inside, with a colorful topping made out of raw salmon, eel, avocado and a blend of sauces. You can dip it in the restaurant’s house-made soy sauce if you like, but the powerful swirl of flavors needs little embellishment. The “Fast & Furious” roll ($18), meanwhile, is constructed out of two types of tuna, avocado, seaweed and fish eggs, with a Latin American vibe thanks to jalapeño and cilantro. As you would expect from a roll named after a Vin Diesel movie franchise, it brings heat, but remains balanced thanks in part to a creamy sauce drizzled on top. 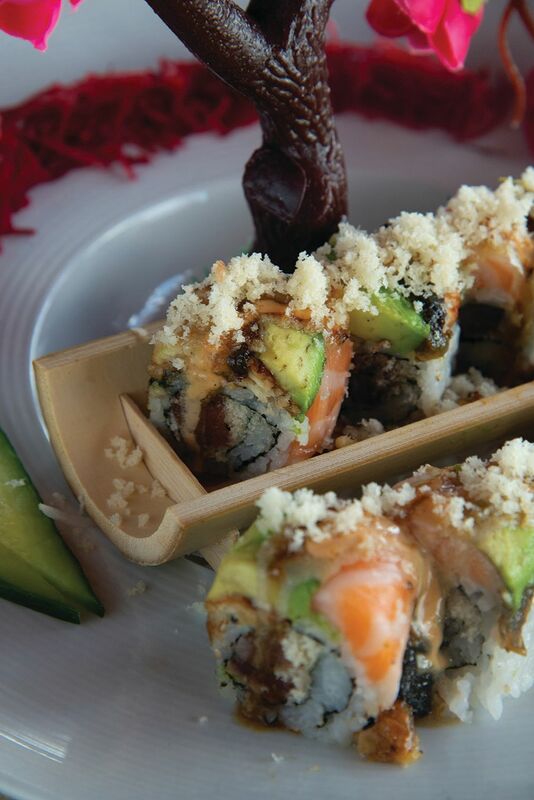 Even the simpler rolls are tasty. The soft-shell crab in the “spider” roll ($10) has been freshly fried, while the “east” roll ($12) hangs together just right with cooked shrimp, avocado and cucumber. (Special credit goes to the servers and sushi chefs for accommodating those with allergies to specific types of seafood.) Wash it all down with some sake, thanks to Bushido’s small but well-stocked list. Venturing outside the sushi section of the menu can lead to mixed results. The Japanese duck appetizer ($14) is made by wrapping steamed buns around teriyaki-style duck and fresh scallions. Delicious in theory, but the duck is too tough. Taking a bite involves wrestling with meat and gristle. All the plates are presented with flair, with small plastic trees glued to plates with sticky rice and even a bowl of lettuce that burbles thanks to the addition of dry ice. Edible? No. But very pretty. Woo has smartly divvied up the dining room with screens that hang down from the ceiling and separate tables from one another. You can still hear the conversation at your neighbors’ table, but the screens offer a surprising intimacy, whether you’re celebrating date night or just meeting up with a buddy.